There was once a blithe, carefree time when Tom Hanks could tap out a tune on a life-size keyboard in FAO Schwarz. But the economics didn’t trickle-down as they should have, and the resulting recession changed just about everyone, even this most beamingly American of performers. Now Hanks is a little less can-do and a lot more world-weary—a quality utilized superbly in Steven Spielberg’s recent Cold War thriller Bridge Of Spies. And he’s no less drained at the start of Tom Tykwer’s trifling adaptation of Dave Eggers’s novel A Hologram For The King, a mordant study of 21st-century big business in the guise of a fish-out-of-water comedy. 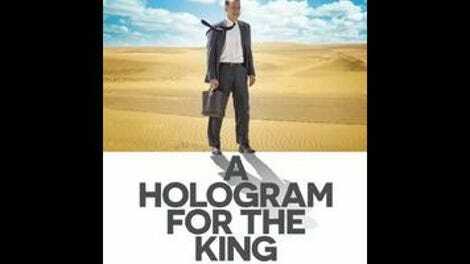 Hanks’ Alan Clay (because, you know, he needs to be remolded) is a down-on-his-luck salesman on a last-ditch trip to Saudi Arabia, where he’s tasked with selling a new holographic communications technology to the country’s royalty. Little in his life has been going right up to this point; an opening fantasy sequence, scored to a Hanks-crooned rendition of Talking Heads’ “Once In A Lifetime,” shows him losing his “beautiful house” and “beautiful wife,” among other status symbols. And the indignities continue overseas, in the forms of persistent jet lag, lack of alcohol, poor wi-fi, and a swelling cyst on his back that Clay, at one point, ill-advisedly pokes with a steak knife. Clay clearly requires some soul-searching, and there are a few horrible moments—especially after he befriends wisecracking Saudi local Yousef (Alexander Black), who shuttles him between locales—when it seems that this will be another in a long line of movies about the wayward Westerner rediscovering himself abroad. It is that to a degree, though Tykwer’s touch is cosmopolitan enough that he manages to unearth the humanity in almost every character. The scenes involving Alan and Zahra (an excellent Sarita Choudhury)—the physician who attends to his cyst, who he eventually falls for—are particularly sweet and gently observant about cultural differences. The film avoids offensive exoticization, though mainly because of its overall inconsequence. 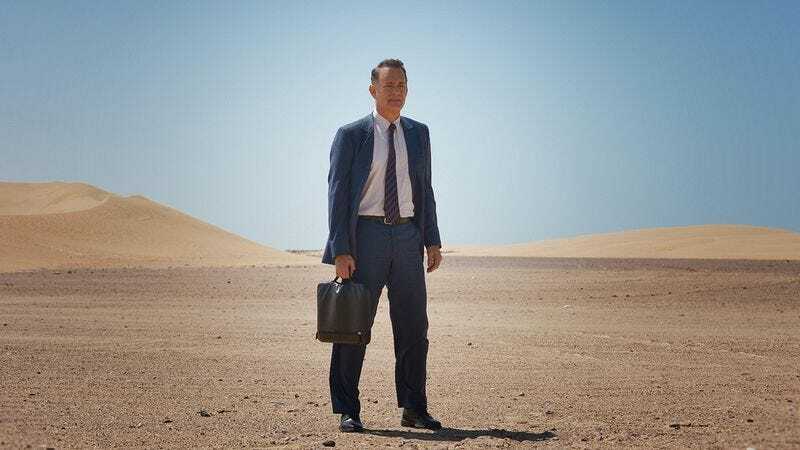 A Hologram For The King is a 97-minute movie that feels like it was cut down from two-hours-plus, with whole subplots reduced or jettisoned in what was likely an arduous post-production period. (It was filmed in the spring of 2014.) Alan’s life in America is seen in awkwardly incorporated flashbacks, and one awful sequence involving his blue-collar father (Tom Skerritt) lambasting him for the outsourcing of American jobs is quite literally phoned-in. (Better that, perhaps, than being beamed-in like Ben Whishaw, making a cursory cameo as the hologram of the title.) A wolf-hunting side-trip with Yousef, meanwhile, plays like something added to pad the running time and make some superficial culture-clash commentary, though it at least affords a few picturesque shots of the camel-strewn desert, courtesy of cinematographer Frank Griebe. The rest of the film will fade from memory like a mirage.